The pictures. That top one appears to be a tad bland because it is just breadcrumbs, although they are paprika-spiced ones as you will discover. And the second picture is not exactly beautiful. Runny. Gooey. Oh, and the best damn comfort food I’ve had in a decade. I’ve reviewed the new book Higgidy: The Cookbook, a book of pies [and more] from Camilla Stephens. She is a co-founder of Higgidy, a British firm that mass produces pies, those very particular British pies that we read about. Here, in her own cookbook, Camilla presents a flotilla of quite lovely and decidedly delicious recipes. This is the first one we tried. And we pigged out on it. There should have been enough for three meals for us. We barely got two. It’s delightful. Bread crumb toppings can be a bit understated. Not when you add that paprika. And we did exactly what this recipe calls for. We bought a lovely chicken cooked at our grocery store, took it home, dismantled it and used the meat for this dish. But, but, here’s an important idea for you. Use turkey. 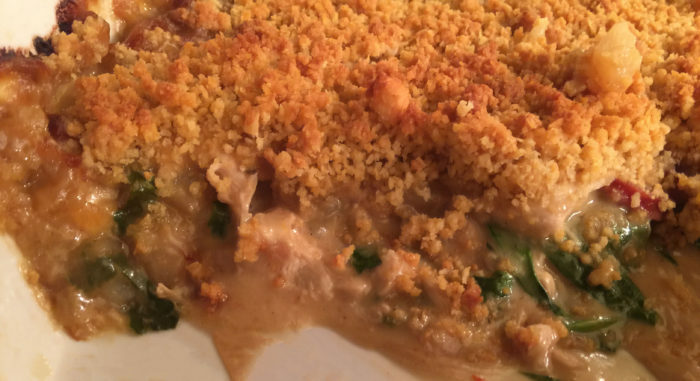 Use leftover turkey from Thanksgiving and Christmas. We’re doing that this Christmas. We’ll probably be doing it every Christmas from now on. Suzi’s eyes watered as she ate this. Unbelievably wonderful. And it has her favorite meat: chorizo. I guess you side this with Spanish wine, or a great British beer or whatever makes you feel comfortable. For this is, truly, comfort food. Heat the olive oil in a large, deep-sided, heavy-based pan with a lid. Add the chorizo, onions and garlic and cook over a high heat for 4-5 minutes or until the onions begin to caramelize and the chorizo starts to release its oil. Add the diced potatoes and cook for 2 minutes. Add the flour and stir to combine, then pour in the chicken stock and give the mixture a good stir. Reduce the heat to low and simmer, covered with the lid, for 20 minutes. You may need to stir the sauce after 10 minutes to stop the mixture catching on the bottom of the pan. Remove from the heat and stir in the cream. Pour into a large bowl and add the chicken pieces. Mix to combine then stir in the lemon zest, lemon juice and chopped spinach. Season well with salt and pepper and set aside. 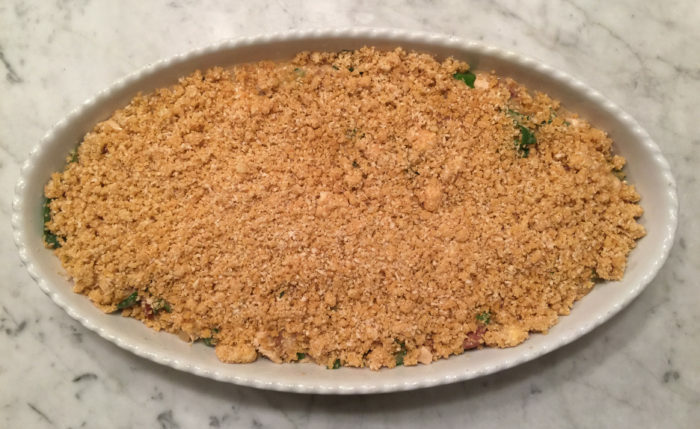 Spoon the chicken filling into your pie dish and sprinkle over the crumble. Bake in the oven for 30 minutes and serve piping hot!